Christmas Party at Western Suburbs Clayworkers: Judy Hamilton meets Lena Tisdall and shares her idea for a Community Art Centre as a drop in centre for artists and the community with Library and meeting facilities. Judy fires off emails to Local, State, and Federal representatives for Indooroopilly regarding setting up of a Community Art Centre. All supportive but no real help. Reconnect with Lena at the Paddington Art Precinct Walk – keeping on going with idea. No feedback from politicians. Meetings with Bill from the Bookbinders Guild, Lena Tisdall, & Judy Hamilton at Gloria Jean’s Coffee Shop in IndroCentral. Looked at the idea of using the Baby Health Centre on Coonan Street as headquarters. Judy was informed that the building was condemned and it was demolished in 2012. Bill, LT, and JH examined facilities at Kenmore with a Men’s Shed. Not large enough. Bookbinders negotiate a lease for a “home”. Lena attends meeting re use of heritage listed site in Yeerongpilly – old animal research centre. Lena submits a proposal for the use of this site as a community arts centre. Lena and Judy continue meetings at Gloria Jean’s. Di Taylor attends the last of these meetings and her knowledge of procedures is tapped into and we decide to go public. First group meeting at the Polo Club. Eight representatives from ATASDA, Scattered Arts, Embroiders Guild, Pastel Society and Sculptors Qld. Decided to have another meeting in December and invite as many groups as possible to attend. Well attended meeting at the Polo Club. 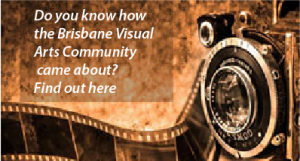 Decision to form Brisbane Visual Arts Community. Enthusiastic meetings with Lena in the chair, held at Toowong Library. Lena and Di Taylor meet with the State Member for Tennyson Ward who initiates a rallying cry “No GoMA without Yeerongpilly”. Inspection of the highly desirable site at Yeerongpilly reveals a sagging wall and a huge $2,000,000 to repair it. Decision made to abandon the idea. Lena and Di meet with Lorraine Gregory from the Brisbane City Council staff who is very supportive and guides Lena through processes. Alternatives to Yeerongpilly are advanced. Windsor School of Arts, Student Centre at old Morningside TAFE, Scout Hall at Weller’s Hill. Qld; Qld Porcelain Artists Inc; Queensland Quilters; Silk Shed Studio Group; Watercolour Society of Queensland; Embroiderer’s Guild; Western Suburbs Clayworkers; Qld Spinners, Weavers, Dyers and Fibre Artists; Leather Crafters Association of Qld, Qld Bookbinders’ Guild; Fusions Clay and Glass Artists; Pastel Society of Australia; Sculptors Queensland. Lena Tisdall – President; Carolyn Foley – Secretary; Judy Hamilton – treasurer. Steering committee Sue Ford, Di Taylor, Wendy Goode, Lyn Baxter, Tarnie Fisher (Tarnie designed the logo). BCC offers the use of the old Wellers Hill Scout Hut for BVAC. Inspection of the premises arranged. Di Taylor and Lena view it from outside in rainy conditions and determine it looks fine except for the muddy grounds. leaseholder and remains the sticking point as this is new in insurance since the 2011 floods. Lena pays this as a loan because the lease application requires it. November First combined art and craft Show for the group held in the Polo Club Basement. One of the wettest days of the year but BVAC made an overall profit of nearly $400. responsibility to repair the damage. May Repairs completed, the lease commenced and the insurance company adjusted the policy commencement date accordingly. Sandra Evans successfully acquired a grant of $14,000 for the building works required to make the property suitable for our requirements, and these were completed during the year. The first groups to rent spaces in the building were Ceramic Arts Qld (formerly Fusions), ATASDA, APAT, QPAI, WSQ, Scattered Arts and Qld Quilters. Qld Quilters were the first group to commence running workshops to the hub, adding to the BVAC bank account. broke even so we decided not to repeat it. Lena commenced discussions with Cherryl McIntyre (LCAQ) about an alternative venue and they attended an Art and Collectables show in West End as research. combined art sale and it was decided to advertise mostly via the internet. This turned out to be very successful. Seven groups chose to participate and the combined sales total made it very worthwhile. At our first AGM Sandra (treasurer) reported that we were able to pay Lena’s loan for the insurance in full and also pay the current insurance bill. We still had a positive bank balance as well. During the year, work continued on improvements to the building. Our second Pop Up shop at Mt Coottha had 14 participating groups and yielded more than double the May result in total sales. May saw the third Pop Up shop with a 50% increase in sales from the previous year. At our AGM Lena handed the presidency of BVAC on to Peter Rayson, who will take it to the next logical stage of the journey.